The achievements of numismatists do not go unnoticed. Each year, the American Numismatic Association (ANA) presents an award to a researcher, author or journalist in recognition of his or her body of work and career contributions to numismatics. Numismatists working to expand interest in coin collecting by recruiting new ANA members also are recognized for their efforts. During the Philadelphia World’s Fair of Money in August, The Burnett Anderson Memorial Award for Excellence in Numismatic Writing was presented to Kenneth E. Bressett, best known for his dedicated work as editor of A Guide Book of United States Coins (the “Red Book”). First conferred posthumously in 1999 to its namesake—a newsman’s journalist—the award is sponsored by Krause Publications. The recipient is selected in a cooperative process by the ANA, the American Numismatic Society and the Numismatic Literary Guild. Bressett, who will celebrate his 90th birthday next month, became active on the Red Book’s editorial staff in 1956, and in 1973 was named editor, effective with the 27th edition. To date, Whitman Publishing has printed more than 24 million copies, making the reliable hobby reference one of the best-selling nonfiction books in American publishing history. The readily recognizable guide was first edited by R.S. Yeoman, with whom Bressett became acquainted in the mid-’50s. Their long collaboration was cordial and fruitful, and together they created more than 300 hobby-related books and products, including a monthly magazine, Whitman Numismatic Journal (1964-68). During his 75 years of numismatic involvement, Bressett has focused his efforts on more than United States coins, expanding his knowledge base and books to include ancients, biblical coins, British issues and U.S. paper money, as well as all aspects of grading, buying, selling and collecting. In 1962 he and fellow numismatic scholar Eric P. Newman co-wrote the quintessential Fantastic 1804 Dollar. Among his other notable works as author or editor are Basics of Coin Grading for U.S. Coins; Buying and Selling United States Coins; Collectible American Coins; A Guide Book of English Coins; A Guide Book of Modern United States Currency; A Guide Book of United States Currency; The Handbook of Ancient Greek and Roman Coins; Handbook of United States Coins (the “Blue Book”); Milestone Coins: A Pageant of the World’s Most Significant and ­Popular Money; Money of the Bible; The Official American Numismatic ­Association Grading Standards for United States Coins; and The Official Whitman Statehood Quarters ­Collector’s Handbook. 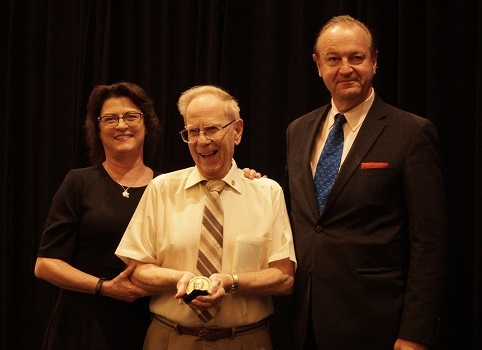 Photo: ANA Executive Director, Kenneth Bressett and Mark Anderson present Bressett with the Burnett Anderson Memorial Award for Excellence in Numismatic Writing. At the World’s Fair of Money in Philadelphia, August 14-18, three members were honored for encouraging fellow coin enthusiasts to join the ANA. The John and Nancy Wilson Member Booster Award (named after the dynamic duo who has recruited more than 2,000 new members for the Association) went to ANA Vice President Don Kagin. Between November 1, 2016, and October 31, 2017, he increased the organization’s rolls by 21 members. Rare Coin Wholesalers of Irvine, California, represented here by company president Michael Contursi (left), accepted the Dealer Booster Award from ANA President Gary Adkins. 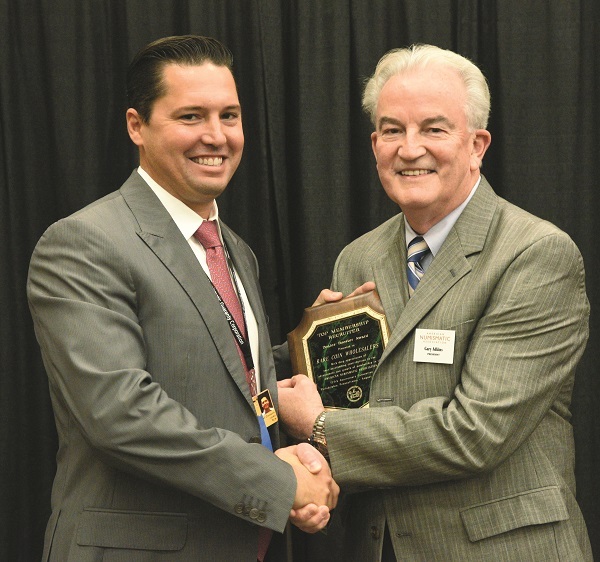 Numismatic pro­fessionals who have sponsored members through their businesses are recognized with the Dealer Booster Award. This year’s recipient is Rare Coin Wholesalers of Irvine, California. The firm, led by President Michael Contursi, recruited 161 members for the ANA. ANA President Gary Adkins is the newest inductee into the ANA Century Club. This ­distinction is reserved for individuals who have recruited a cumulative total of 100 or more members.